Several interchangeable modules for pressurized and unpressurized cargo. The Spacecraft consists of a Service Module (SM), which can be used with either a Pressurized Cargo Module (PCM) or an Unpressurized Cargo Module (UCM) (now cancelled). The PCM is based on the MPLM-Logistics-Module, while the UCM is based on the Express Cargo Carrier, which were both used with the Shuttle. The PCM is manufactured by Thales-Alenia. 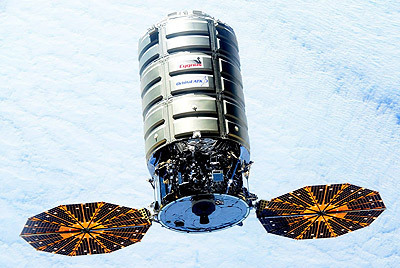 The enhanced Cygnus spacecraft will be capable of delivering up to 2,700 kg of pressurized cargo to the ISS. It can also carry an external CubeSat dispenser (first flown on OA-6) and can host internal modules with experiments to be conducted in free flight after the ISS mission. The enhanced Cygnus will be used beginning with the fifth Cygnus mission. Due to the explosion of the first Antares-130 rocket, which was originally planned to launch all enhanced Cygnus missions, the first two will fly on an Atlas-5(401) launch vehicle with the reengined Antares-230 taking over in 2016. Also they are planning to fulfill the cargo contract with only four instead of five remaining missions. In March 2015, one more mission was added to the contract for launch in 2017. In August 2015, two more missions were added. Under the CRS-2 selction in January 2015 Cygnus was selected for a minimum of six missions, which might use both Antares-230 or Atlas-5(401) launch vehicles and may include versions for unpressurized cargo and extended length pressurized versions.